DAYS TO CONVERSION REPORT · 10-MINUTE READ · By Misty Faucheux on December 13 2017. Google AdWords – not surprisingly – has updated their platform again. They’ve been doing this pretty regularly to ensure that we as marketers have a useful advertising tool. This time they’ve added a feature that had only been present in Google Analytics: the Days to Conversion Report. If you’ve never explored this report in Analytics, it basically breaks down how long it takes for someone to go from click to conversion. But, why is this important? We all know that not every click leads to a conversion. But, we also have learned from experience that many clicks don’t lead to conversions immediately. This is especially true of top of the funnel marketing channels like social and content marketing. Yet, the same can even be said of an AdWords campaign. Depending on what phase of the buying cycle the visitors are in when they initially come to your website, they may return to the site several times before ever making a purchase. For example, if someone is doing research and comparing your products or services to your competitors, they make take several weeks (especially for lower ticket items) or months (especially for higher ticket items) to decide which one they want to buy. This is where the Days to conversion report is especially helpful. It breaks down how many days it took for a conversion to happen. In the screenshot below, all the conversions in this particular campaign happened within a day of the click. Yet, that’s not necessarily true for most conversions. And, in some cases, conversions could happen weeks after the first click happened. The Days to conversion report is basically a quick overview of how long it takes for your customers to convert. But, how can you use this in your own reporting? Now that you can see how long on average your customers take to convert, it’s time to start adding this data to your own success metrics reports. For stakeholders and clients, the information in the Days to conversion report could really be useful to prove that your AdWords campaigns are delivering on promises. Many of these same people see reports on a week-to-week or month-to-month basis. So, they may get nervous if the see a lot of conversions one week and none the next. Yet, if you can demonstrate that – on average – it takes 8 days for a click to result into a conversion, then you might only have a large number of conversions one or two weeks out of the month. Adding the Days to conversion data could placate an otherwise nervous stakeholder and allow you to set realistic goals. Another benefit of this report is that you can leverage the insights for your promotions calendar. Perhaps, you have a goal to increase conversions during month X, and you’re doing a special offer only during that month. If you understand that the majority of your clients can take upwards of two weeks to make a purchase, then this may help you figure out when to start running the campaign. For example, maybe you want to start the campaign two weeks early to get the promotion in front of your potential clients. Then, when they inevitably come back to the site, it will be during the offer period. To make the report even more interesting, you can pull the Google Analytics Days to Conversion Report into it, especially top of the funnel channels like content marketing and social. This way, you can showcase the big picture of how your marketing campaigns work. This might also give you more audience insights, especially in relation to buying habits. For example you can see how campaigns run on different platforms affect each other and the time it takes a user to convert. The easiest way to pull such marketing data into a single report is to take advantage of third party data automation tools, such as Supermetrics. You can easily fetch the needed marketing metrics from AdWords, Twitter, LinkedIn, Bing, Facebook and multiple other platforms in a single spreadsheet or Data Studio report. Finally – and perhaps the most relevant use of this report – Days to conversion can be help you make informed decisions about optimization. 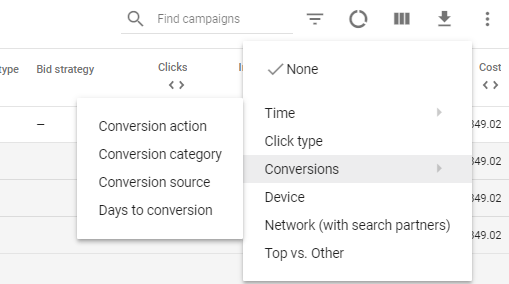 We all get nervous when we don’t see conversions within the first few weeks, especially if we have clients who aren’t familiar with how AdWords work and what to expect from their first campaign. This often leads us to think that maybe we should change the ads, keywords, budget, etc., instead of letting it run for a few more weeks to see what happens. If you’ve run similar or even the same campaigns before, looking at the Days to conversion report should help you forecast when you can expect your first conversions, which you can then relay to your client. To access the report, go to your main Campaign tab. Click on Segment (the circle in the right-hand corner under the graph.) Select Conversions, and Days to Conversion. The report data will populate under the campaign. To remove the segment information, simply click on Segment again, and select none. If you’ve just launched your campaign, you might not have a lot of conversions. This is when you’ll often see that “one-day conversion” schedule. As time goes on, however, you’ll get more conversions and receive more insights into how long on average conversions take. You may want to let this report run for a couple of months before trying to glean insights from it. Note: This report is only available in the new AdWords platform. If you are still using the old version, you will have to switch to the new one. The major advantage of this report is that you can now make realistic decisions about when to optimize your campaign and when you can expect conversions. You can even use it for forecasting if you’re running a similar campaign targeting a comparable audience. When you initially add this data into your report, you might need to break down the implications for your clients and stakeholders. Once you do, however, you’ll be able to allay fears regarding lack of conversions, especially on a week-to-week basis.